More than 500 pages of mystery tales from the pages of THE HOUSE OF SECRETS #81-98 (1969-1972)! 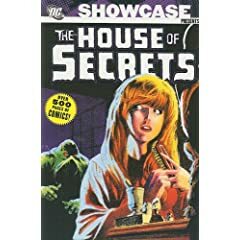 This publication reprints the comic book series The House of Secrets. The comic was a horror-themed anthology, and so used a variety of creators on each issue. The first 80 issues of the series have yet to be reprinted or collected. Following the issues reprinted in this publication, the series continued until issue #154 in 1978. Those issues have yet to be reprinted or collected.